If you seek low-key, highly independent, psychedelic folk-country-pop-rock and you're over thirty, you probably own at least a few Victoria Williams CD's. You might even have some LP's or tapes--remember them? Back in 1987, when Williams released her first album, Happy Come Home (Geffen), record covers still carried the label "Also available on cassette." By 1990, on the back of her second album, Swing the Statue! (Rough Trade), Williams could note, "Available on CD, cassette, LP and 8-track (only kidding)." Over a decade later, both of those classics are out of print in every format. Williams's latest recording, Sings Some Ol' Songs (2002, Dual-Tone), has been released only on CD. The technology has changed (evolved? ), the music industry has changed (devolved! ), but Victoria Williams remains her inimitable self, a combination of folksy charm, quirky wisdom, and naturalness bordering on naïveté. Like a psychedelic folk-country-pop-rock Joseph Cornell, she assembles the discarded stuff of life into unpretentiously spiritual works of art, daring us to ask if she's serious and if she's to be taken seriously. On Happy Come Home, one of the strongest and strangest debuts ever released by a major label, Williams celebrates seemingly commonplace objects and acts. "Little red bike / Out on the main road / Lucky little girl," she remembers. "Be sweet, be free / Every day is poetry," she declares. Did Geffen Records really think the marketplace would welcome this squeaky-voiced, Louisiana-born bohemian singing imaginative, unpredictable, sweetly melodic paeans to shoes, a frying pan, a merry-go-round, the lights of a city, the statue of a bum (who "said no to the silver / no to the gold")? Rickie Lee Jones and Kate Bush, her immediate precursors, had shown that unconventional voices addressing unconventional subjects could achieve mainstream success, but Williams's subjects risked looking silly and her voice, like Jones's and Bush's, sometimes rose to shrillness. Produced by percussionist Anton Fier (once of the Feelies, once of Pere Ubu once of the Lounge Lizards, for a long time the leader of the Golden Palominos) and multi-instrumentalist/singer Steven Soles (once a Bob Dylan sideman, once a member of the Alpha Band with T-Bone Burnett), the record would prove Williams's glossiest, sometimes employing electronic drums and sometimes cushioning her voice with a big backup chorus. Even at its sparest, the sound was arty. In retrospect, string arrangements by composer, producer, musician Van Dyke Parks (best-known for having collaborated with Brian Wilson on the ill-fated Smile) make these pieces seem like models for the kind of chamber pop that, among others, Duncan Shiek and Rufus Wainright (who has worked with Parks) later brought to a wider audience. In place of Happy Come Home's session players and Downtown Manhattan guest stars, a studio band gives Swing the Statue! a much freer, more organic, even swinging sound, as on the funky "On Time" and the zydeco-influenced "Vieux Amis." Percussionist Michael Blair, Williams's coproducer, brings to some tracks the eerie undertow he'd added to, for example, Tom Waits' Rain Dogs (1985) and Franks Wild Years (1987). Everyday poetry remains Williams's aim, as she celebrates the moon, a clothesline, weeds, and wobbling-yes, as in the form of irregular motion. With "Holy Spirit" and "Lift Him Up," Williams extends the physical to the metaphysical, continuing the religious thread she began with Happy Come Home's cover of the Reverend James Cleveland's "I'll Do His Will." But as though to prove that being a Christian with weird ideas doesn't mean being an "outsider" artist, she also presents two catchy, hook-laden, secular tunes worthy of being hits: "Tarbelly and Featherfoot" and "Summer of Drugs" are, respectively, surreal and personal narratives that Lou Reed and Soul Asylum would turn into gritty and fiery rockers two years later. By 1992, Williams had released a pair of critically acclaimed albums; been the subject of a half-hour documentary, also called Happy Come Home, by Chris Hegedus and D. A. Pennebaker (the latter perhaps best known for having directed the 1967 Dylan documentary Don't Look Back); and been divorced from her husband, singer/songwriter Peter Case (once of the Plimsouls). Diagnosed with multiple sclerosis in the spring of that year, she became the recipient of one of the earliest and most aesthetically consistent in the long line of '90's tribute compilations. Coordinated by Sylvia Reed and Kelley Walker to help pay Williams's medical bills and to raise awareness about musicians' lack of health insurance, Sweet Relief (1993, Thirsty Ear/Chaos/Columbia) would be worth owning if only for the Lou Reed and Soul Asylum tracks. "Alternative" kindred spirits including Lucinda Williams, Maria McKee, and Matthew Sweet also contribute some of their best-ever performances. Pearl Jam's take on the then-unreleased "Crazy Mary" seemed definitive until the composer delivered her own version on Loose (1994, Mammoth), a long and sprawling collection, "egalitarianistic in theory at points," as Williams puts it in her liner note. Produced by Paul Fox (once of the English punk band the Ruts, believe it or not), and featuring guest stars such as Mark Olson (once of the Jayhawks, and Williams's second husband), Dave Pirner (once and maybe still of Soul Asylum), and Peter Buck (still, after all these years, of R.E.M. ), this collection takes a cue from Sweet Relief in adding loud electric guitars and rock rhythms to the acoustic-folk styles of Swing the Statue! It also returns Van Dyke Parks's strings to the mix. Recording after the nearly simultaneous deaths of her grandfather and her beloved dog, Williams faces and embraces mortality. In the opening track, "Century Plant," she takes inspiration from a cactus that blooms only once in a hundred years. "Hey, do you want to come out / And play the game?" she asks. "It's never too late." As she celebrates ecstatic moments in "Love" and "Sunshine Country," ordinary pleasures in "Polish Those Shoes" and "When We Sing Together," the music, in its intricate, elegant textures and multipart harmonies, matches, even illustrates, her writerly attention to the concrete and particular. 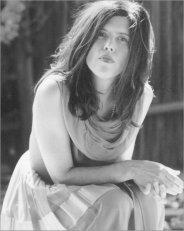 "This moment will never be again," Williams acknowledges in the title track to her live CD, This Moment: In Toronto with the Loose Band (1995, Atlantic), on which a new song called "Graveyard" directly addresses the somber reality beneath Loose's lighthearted surface. A souvenir of her first-ever tour as a headliner, This Moment really marks Williams's transition to full-fledged, so-called alternative country. The top-notch Loose Band--musicians who'd played on Loose, though not necessarily together--equal or better Williams's studio arrangements, while David Mansfield (like Steven Soles, a former Dylan sideman and member of the Alpha Band) provides the genre's characteristic southwestern accents on violin, mandolin, and pedal steel. Coproduced by Trina Shoemaker (who'd worked on, for example, late Throwing Musings and early Lisa Germano records), Creek Dipper feels like a concept album about nature and flow. With titles such as "periwinkle sky," "kashmir's corn," "tree song (eucalyptus lullabye)," "grandpa in the cornpatch," and "blackbirds rise" (a retitled version of "Graveyard"), its dozen songs lope along pleasantly, although some lose their distinctiveness in the overall drift. The blurry and obscured cover photos on Water to Drink (2000, Atlantic) threaten simply more of the same, but Williams and coproducer J. C. Hopkins (of the obscure folk-rock band Flophouse) create a cohesive sound that encompasses various styles while preserving each song's melody and identity. From the guitar-noisy drone of "Grandma's Hat Pin" to the pop-soul of "Gladys and Lucy" to the girl-group-meets-chanson of "Claude" to the stately, classic-rock shuffle of "A Little Bit of Love," the songs are mature but still playful, professional but utterly personal, consistently engaging even when lyrically obscure. They celebrate love, but often approach it from odd angles, as in "Lagniappe," a country-soul homage to the Louisiana word for "a little something extra," and "Junk," a Neil Young-meets-the-Beatles-like acknowledgment that "one man's junk is another man's jewel." Criminally overlooked and currently out of print, Water to Drink may be the culmination of every path Williams has taken to this point, and its mandolin-and-horn-embellished ballad "Joy of Love," with intertwined harmonies by Mark Olson and Petra Haden (daughter of jazz bassist Charlie Haden, and once a member of the indie-pop band with the uncapitalized but punctuated name that dog. ), might be Williams's single most beautiful and sophisticated performance yet. Van Dyke Parks makes another guest appearance on Water to Drink, providing string arrangements on two of three covers, the standards "Until the Real Thing Comes Along" and "Young at Heart." (The third cover is the title track, an English translation of Antonio Carlos Jobim's "Agua de Beber" and Williams's first venture into Brazilian rhythms.) Parks doesn't contribute to Sings Some Ol' Songs, but Williams's latest covers seem drawn from the same vein and, indeed, largely derive from the sessions for Loose and Water to Drink. Of course, she has been updating classics, magnificently, all along: "What a Wonderful World," "Nature's Way," "Nature Boy," "Imagination," "Smoke Gets in Your Eyes." An entire CD of other people's songs shouldn't surprise us, yet most objective listeners, people other than Williams's diehard fans, wouldn't think to pair her voice with, say, "Moon River." In giving the "ol' song" her all, though, she makes it her own, as she interprets other songs we've heard countless times (such as "Over the Rainbow," "My Funny Valentine," "As Time Goes By," Jobim's "And Roses and Roses") and a few that are less familiar ("Keep Sweeping the Cobwebs Off the Moon," "Mongoose," "Do You Know What It Means to Miss New Orleans"). If on Water to Drink, Victoria Williams finally, irrefutably, became an all-around great record-maker--singer, songwriter, guitarist, arranger, producer--on Sings Some Ol' Songs, she reminds us that making records is finally, irrefutably, about giving a voice to other people's emotions. "I'm old fashioned," she sings, delivering a standard by Jerome Kern and Johnny Mercer. "That's how I want to be / As long as you agree / To stay old-fashioned with me." As she's done throughout her career, Williams invites us to loosen up, let down our guards, and listen to her music as open-heartedly as she creates it.